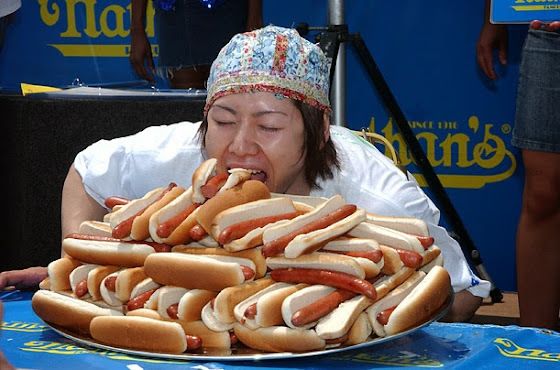 Takeru Kobayashi at Nathan's Famous hot dog eating contest. The medical term for skinny fat (TOFI- thin outside fat inside) is called metabolically obese normal weight. Your weight isn't above a healthy range for your height but you have excess visceral fat and not enough muscle. Previously I discussed how overweight people don't necessarily have to be over-fat. High weight and high fat are not the same thing. You can be skinny but have excess fat and it can be quite dangerous. In a new study from the Journal of the American Medical Association, nearly 1 in 4 skinny people have pre-diabetes. People with type 2 diabetes at a normal body weight have twice the risk of death. Since we associate good health with being skinny, many people who don't have an obesity issue but have type 2 diabetes just consider it a minor irritant. Many may still consider them healthy otherwise since they're skinny. The lack of musculature is one step closure to death in this case. Maybe not. 37% of teenagers with normal body weight (skinny) had one or more signs of pre-diabetes. Maybe what you thought was skinny was really metabolically obese normal weight (skinny fat). We already knew the kids dealing with obesity were unhealthy (1/3 of adolescents in 2012), but if the kids with normal weight are also having health issues, how many children are left who are healthy?